In the course of the previous day's food quest, the security guard at the county courthouse (a public bathroom quest was also in progress) insisted that the best pork BBQ in the region was to be found not in Athens, or anywhere near Athens, but in Anderson, South Carolina. 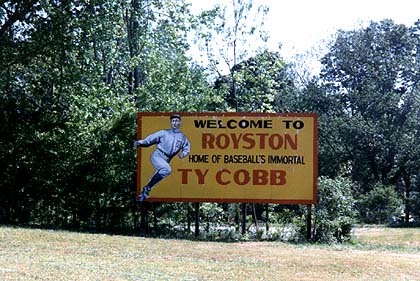 With all day to get to Atlanta, and Ty Cobb's home town of Royston conveniently sited halfway between Athens and Anderson, the plan was obvious: I'd take the long way to Atlanta. When it comes to spectator sports, for excitement, I prefer ice hockey. But for metaphor, there's no substitute for baseball. It's as much a part of the American psyche as the Civil War (yes, Ken Burns is onto something). It's occurred to me that I spend more time reading about the game that actually watching it, possibly because of my preoccupation with the connections between the past and the present. Royston is an attractive, sleepy town of neat white homes and deep green landscaping. At the general mercantile store on the main street, the sweet octogenarian proprietress was pleased when I complimented the town where she'd spent her whole life. But when I mentioned that I was headed to South Carolina for barbecue, her face darkened: "We've got a barbecue place right outside of town that we think is pretty good," she replied slowly in a tone clearly intended more to reprimand than to enlighten. Barbecue is a religion in these parts. Much more so than baseball. So off I went to the Cobb exhibits at the town hall and the town library, then I headed for the town cemetery.